Rotherham-based Crawshaw Group PLC, the fresh meat and food to go retailer, has given an update on the festive trading period which included its biggest ever Christmas week. The AIM-listed Hellaby firm has a stratagy focused on accelerating the rollout of its factory shop format. These destination sites are seen as particularly attractive as they allow the retailer to offer even greater value to customers through larger pack sizes and value progression. For the 15 week period to December 24 2017, total group sales increased by 0.6% compared to the same period in the previous year, with group gross margin also increasing by 0.6%. Crawshaw said that it was making continued progress on its strategy and that the performance was underpinned by the strength of the growing factory shop format, which helped to offset the impact of lower footfall on the high street and the "overall softer consumer sentiment" which meant that group like for like sales were down by 6.1% and group like for like customers had reduced by 2.6%. Festive trade saw group sales in the week leading up to Christmas reaching a record £1.8m and almost 3,500 value meat hampers sold. 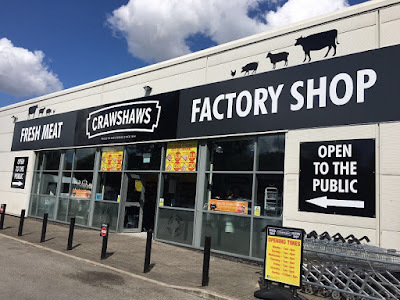 Crawshaws now operates ten factory shops within its 54-shop estate, with five more planned for the year. Factory shops are expected to account for well over half of group revenue in 2020 and the new factory stores are on track to deliver a circa one-year cash payback. Factory shops are a simpler model to implement and operate, have lower rents and require significantly lower set up costs. In April 2017, heads of terms were agreed on a deal for 2 Sisters Food Group founder and chief executive, Ranjit Boparan (and connected party), to invest approximately £5.1m for a 29.9% stake in Crawshaw, with warrants to acquire a further 20.1% of the Group. The update said that the partnership, which includes an initial three-year supply agreement, is progressing well. Overall, the board anticipates a period of transition as the necessary actions are taken to move the business towards the factory shop model. Noel Collett, CEO of Crawshaws plc, said: "On balance, this was a solid core Christmas trading performance against what remains a very tough high street environment. Our biggest ever Christmas week and the record number of meat hampers sold clearly demonstrates the trust our customers place in us for their most important meat spend of the year. This gives us a solid platform to improve trading momentum going into 2018. "We continue to focus on strengthening Crawshaws' position as the country's best value butcher. We are excited by the performance of our factory shops and by the progress of our 2Sisters supply agreement and, while there is much to do, we remain confident that this combination will be transformational for the long-term growth of the company."